Information Open Space Visitors Center gallery. The Open Space gallery is open 9 a.m. 5 p.m. Tuesday through Sunday and is closed on Mondays. For more information, call (505) 897-8831 for more information or visit Open Space. The purpose of the Open Space Division is to acquire, protect, maintain, and manage significant natural landscapes and cultural resources for present and future generations. The Open Space Visitor Center Gallery currently has openings for the 2020 calendar year. Located at the end of Bosque Meadows Road between Montaño and Paseo del Norte. Submissions should be postmarked or delivered before July 26, 2019. The purpose of the Open Space Division is to acquire, protect, maintain, and manage significant natural landscapes and cultural resources for present and future generations. Major Public Open Space enhances the urban environment and provides wildlife habitat while offering opportunities for public enjoyment through outdoor education and low-impact recreation. The Visitor Center and Gallery act as a hub for the City's many beautiful Open Space properties. "The mission of the Open Space Visitor Center Gallery is to inspire an exchange of ideas, solutions and interpretations as they relate to Open Space lands so as to deepen and enhance visitor understanding, appreciation and stewardship for Albuquerque's unique natural and human community." Selected exhibits are displayed for three months. The Open Space Visitor Center is not a commercial gallery. None of the staff benefits financially from art sales. Thirty percent of sales are donated to the Open Space Alliance non-profit organization. Seventy percent of sales go to the artists. Artists are responsible for promoting their exhibits. The Visitor Center issues press releases and house-made posters. It is the responsibility of the artists to print postcards and contact collectors if they so desire. Artists are encouraged to visit the gallery and greater facility prior to submitting their proposals. The Open Space Visitor Center is open Tuesday through Sunday from 9 a.m. to 5 p.m. The brief proposal description must outline the perspective artwork and its use of the space. Outdoor Land Art will be considered. Group proposals are also welcome. In the description, take care to embody aspects of the above mission statements. Artists who wish to complement their exhibits with educational components, such as demonstrations or workshops, are encouraged to include that in their proposal descriptions. At least six professional-quality images, in JPEG format, of works that best represent your proposal. Artist collectives must provide between 1-4 images per person. Please do not embed images in a Word or other document; submit them as separate files. All applicants must submit their proposals in one of the following ways: on a mailed or hand-delivered CD or thumb drive. Emailed submissions have proven problematic in the past and are thus discouraged. If you submit via email, please ensure that your files do not exceed 10 MG, and follow up if you have not received an acknowledgement of receipt within 5 business days. Ideas for connecting the exhibit to potential programming (workshops, presentations, screenings, etc.) would be an additional plus. 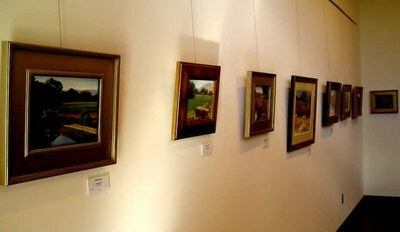 Thank you for considering the Open Space Visitor Center Gallery. We look forward to receiving your submission.